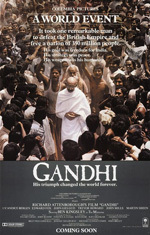 Gandhi: The film doesn't delve deeply enough into Gandhi as an individual, but is required viewing for anyone who wants to see an epic about a nonviolent movement that changed the world. A Short Film About Killing: Polish director Krystof Kieslowski announced himself as one of cinema's greatest poets with his series of films based on the Ten Commandments, The Dekalog. His response to "Thou Shalt Not Kill", this film is a story about a murder and the capital punishment meted out to the perpetrator that was so powerful, it led to the abolition of the death penalty in his home country. Saving Private Ryan/Munich: Spielberg's films about the Second World War and the Middle East conflict; one helped war veterans open up about the trauma of their fight, the other bravely states that violence only begets violence, and no matter how just the cause, taking human life costs more than movies usually like to say. The Battle of Algiers: A documentary-style drama about colonialism and struggling against it. Both the indigenous activists and the colonialists are shown to have their reasons, and the horror of what is often meant by "repression" on the one hand, and "freedom fighting" on the other is clear. The Up Series: Filmed in seven-yearly bursts since the early 1960s, Michael Apted's documentary series is a unique record of life in the past half century; the nature-nurture debate; and the question of what makes a meaningful life. Lone Star: John Sayles explores the necessity of ethnic reconciliation in the U.S. through a complex thriller narrative on the Texas/Mexico border. His answer to the question of how to move on from our preoccupation with violent conflict? "Forget the Alamo." Field of Dreams: Not an obvious film about social change -- but if the basic unit of society is the family (whatever size or shape), then healing family wounds might be one of the keys to peace in the rest of the world. And you can't watch Field of Dreams without wanting to have a better relationship with your parents! Gareth Higgins is a writer and broadcaster from Belfast, Northern Ireland, who has worked as an academic and activist. He is the author of How Movies Helped Save My Soul: Finding Spiritual Fingerprints in Culturally Significant Films. He blogs at www.godisnotelsewhere.wordpress.com and co-presents "The Film Talk" podcast with Jett Loe at www.thefilmtalk.com.